No microphone locker is complete without a Shure SM57 microphone (or five). Great for live sound or studio recording, the SM57 handheld dynamic is one of the most popular mics in the world for faithfully capturing audio from any vocal or instrumental source. You can trust Shure's legendary reputation to deliver professional results on all of your audio projects. The SM57 is a rugged dynamic microphone that can handle extremely high sound pressure level (SPL) without distortion. As a result, it is often picked first for high-volume instrument sources. Countless hit recordings feature an SM57 on the top snare head, with a second SM57 run phase-reversed on the bottom. This technique will give you a fat, snappy tone with plenty of stick-crack and snare buzz. You can blend the two mics in the mix to get just the right back-beat for your song. Guitar amplifiers are another SM57-friendly sound source. It takes some major gain to overdrive a high-wattage tube amp. In fact, recording studios will often isolate a half-stack in its own room while the guitarist listens at a safer volume over headphones in the control room. Your SM57 can handle it, though. Close-mic one of your amp's 12-inch speakers and you'll get a clear, precise guitar tone that will cut through any mix. You'll bring the energy of a live performance to your recorded guitar tracks, for a much more accurate interpretation of your music. While snare drums and guitar cabinets are two of its strengths, the SM57 has a custom-tuned frequency response from 40Hz to 15 kHz, which covers a wide range of instruments and voices. Tapered bass roll-off from around 750 Hz removes the boominess from vocals and instruments alike, with a ruler-flat response up to 3kHz. Enhanced definition up around the 6-10 kHz range brings brilliance and clarity to upper harmonics, adding sparkle to the top of your mix. It's hard to believe how something so simple as the proper microphone can have such a positive impact on your final product, but one listen to the SM57 and you'll be a believer. Today's multitrack recording techniques often rely on good separation between recorded tracks. If one instrument is bleeding over onto another instrument's track, it can be difficult to balance the two properly in a mix. The SM57 uses a cardioid pickup pattern to focus on a specific sound source. Audio from outside the pickup pattern is rejected for clean, isolated studio recordings. The unidirectional pattern is also beneficial in a live-sound setting. You have more freedom in mic positioning, letting you boost microphone gain much higher without worrying about feedback. Professional sound quality is only part of the story. The SM57's rock-solid reliability is just as impressive. After all, what good is a "go-to" microphone if it's not ready when "gone-to"? The die-cast steel casing protects internal components from damage, while Shure's patented internal shock mount reduces mechanical noise caused by handling or room vibration. A polycarbonate grille shields the stainless steel dynamic element from the rough treatment typically inflicted upon a touring microphone. Gig after gig, session after session, you can count on your SM57 to perform just like the first time you plug it in. The SM57 has passed Shure's now-famous drop test: Shure employees dropped the mic from a seventh-floor balcony, picked it up, plugged it in -- and heard no loss of performance. Ideally, your mics won't suffer that kind of torture, but isn't it nice to know they can survive it? For further proof of this legendary mic's reliability, look no further than the White House. A pair of slim, unobtrusive SM57s with discreet black foam windscreens have perched atop the Presidential podium for more than 30 years, delivering the goods with workhorse consistency. The next time you bump into the leader of the free world, mention that you use the same microphone. The President is sure to be impressed. grille and a stainless steel screen. What can you say about the Shure SM57? It is a tool found in the workbench of every sound engineer, both for live and studio applications. There's simply no question: it's a "must-have" mic. 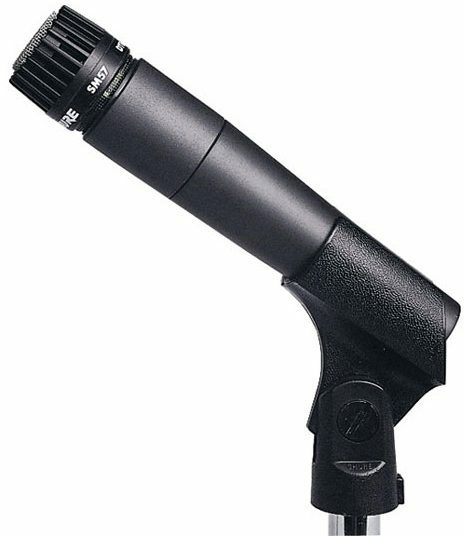 The SM57 is a cardioid (unidirectional) dynamic microphone with a contoured frequency response of 40 to 15,000 Hz, perfect for clean reproduction of vocals and instruments. But the SM57 is most renowned in the music industry as the standard microphone of choice for snare drums and guitar amplifiers. Go to any stage or studio and you're likely to find SM57s pointing at the amps and snare. By the way, the '57 has been proudly standing on the podium of the US President for over 30 years, so you can add patriotism to its outstanding attributes! This mic is also known to take a beating and come back for more, so tell your roadie Rocco to have a ball! Its outstanding performance, legendary reliability, and diversity of application make this "workhorse" the choice of performers, producers, and sound engineers the world over. Sound: A very natural reproduction of sound live or recording. Audio environment friendly Ease of Use: C'mon man! Quality: lasted me 15+yrs of heavy use so far! Manufacturer Support: never had to.... The Wow Factor: I never leave home on the way to a gig without the SM57 on my guitar case as well as a small mic stand. I reposition my own mic in front of my amp cause half the sound man out there are not guitar players! some are computer geeks running the sound boards! Overall: I have been using the SM57 20+yrs weather its on toms,snares,Bass drums(yes! Bass drums! )guitar amps,percussion,vocals you name i"ve been there done that. Very easy and quick to get awesome sound and EQ on the mixer.I purchase a Jet city isolation cab six month ago and installed an Eminence Lil Texas. Long story short I wanted to get away from that SM57 mic for recording purposes and try something else.I tried Audix i5,senheiser 609,xl's and other brands under $200 range no matter what I did i could not get a good descent sound. After six month of experimenting I grab one of four SM57's I own,well needless to say the true awesome guitar sound is back and works with pro tool 9 tons better than the other mics. Don't get me wrong other mics that I mentioned sound great but they get lost in the mix or you have to do massive EQ changes.To my ears,the SM57 is more natural or lets say a more audio environment friendly,very reliable,I own four of these and have lasted me 15+yrs now through a lots of set ups and tear downs as well as accidentally drops.Cant go wrong with the SM57 and for $99 a piece,one of the best musical equipment purchases you will make, I have no regrets.... I purchased mind for $79 each 15+yrs ago brand new! Style of Music: All kinds where loud Electric Guitar is wanted!